E.P.O.C.A. 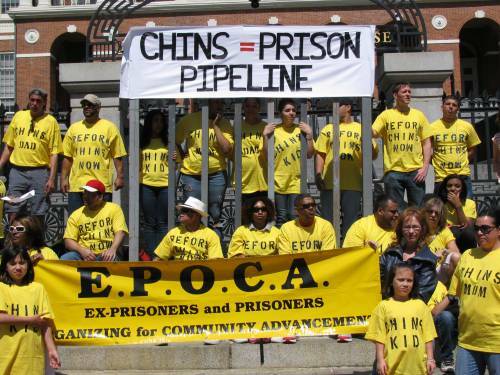 (Ex-prisoners and Prisoners Organizing for Community Advancement) is an innovative group from Worcester, Massachusetts, that provides leadership and organizing training for formerly incarcerated people. The outcome of this training provides participants with skills and resources that enable them to build capacity through community networks. With a Self-Development of People grant of $15,000, E.P.O.C.A., through training and empowerment programs, also assists the formerly incarcerated by connecting them to greater employment opportunities. E.P.O.C.A. has been successful in working with other community partners in organizing campaigns to make major legislative policy changes at the state and local level regarding formerly incarcerated people. In their work of revitalization, E.P.O.C.A. recognizes the needs of those who are formerly incarcerated and pays special attention to related intersectional issues such as homelessness, the need for driver’s licenses, shelters, court watch, navigating the criminal justice system, addressing court sentencing policies, affordable housing issues and exploring models of restorative justice. This Easter season, the work of E.P.O.C.A. functions as a reminder that Christ’s resurrection calls us to be God’s people of renewal, revitalization and transformation, just like the lives changed by this innovative program. New life is possible for those returning to society and looking for ways to change their own lives and the lives of their families. E.P.O.C.A. embodies the power of hope found in this season. On Self Development of People Sunday, we invite you to download our resource to learn more about the work of building stronger communities and promoting justice through community partnerships. The SDOP Sunday resource (at presbyterianmission.org/ministries/sdop/sdop-sunday) lifts up stories of community building, self-reliance, and hope — stories of God in action. It also provides hymns, liturgical suggestions, and ways to access other free SDOP resources that are available to you and your congregation. God of growth and vibrant life, send us your light and your truth so that we may continue to see Christ in the those who are ravaged by poverty and oppression. Loving God, remind us that your gift of the resurrection is a call for us to be cultivators of generosity and sowers of justice. Redeemer God who takes the side of the poor and disinherited, remind us of your call for us to do so as well. Amen.